"Republican Rep. Barbara Leff is a rising star who's head and shoulders above the other House candidates - Republican and Democrat.
. . . Leff, seeking a third term, established herself this past year with her hard work and skillful negotiations in shepherding an omnibus and bipartisan managed care reform bill. Her work earned her Legislator of the Year honors from the National Republican Legislators Association." 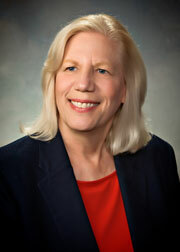 Barbara Leff retired from the Arizona State Senate as of January 2011 due to term limits. She served three terms (six years) in the Arizona House of Representatives and four terms (eight years) in the Arizona State Senate. Barbara was also the President Pro Tempore of the Senate, the Chairman of the Commerce and Economic Development Committee, Vice Chairman of the Finance Committee and a member of the Health and Rules Committees. Barbara graduated Phi Beta Kappa with a Bachelor's Degree from Boston University. She also has a Master's Degree in Social Work from Simmons College. Barbara's work experience includes being a Medical and Psychiatric Social Worker for the Veteran's Administration, a Certified Community College Instructor for the Maricopa County Community College System and the owner of a small retail sporting goods business in Scottsdale. Barbara also has years of experience in the volunteer sector, including running a program that resettled Russian refugees in the Valley. Her focus was to create and run a program to help the refugees be successfully employed and therefore, self-sufficient. Barbara's work and volunteer experiences led her to the world of politics. She volunteered on Jon Kyl's first campaign for the United States Senate, spending many hours working on his behalf. Barbara has been married to Dr. Edmund Leff for 45 years. They have two children. The Leffs have lived in Paradise Valley for 35 years. Barbara's legislative achievements include sponsoring bills which improve the quality of health care; prevent frivolous lawsuits; protect social security numbers to prevent identity theft; put felons in jail for life with a third felony conviction; allow people to ship wine to Arizona and to order wine directly from small wineries; educate children on the prevention of skin cancer and make sure tobacco taxes are used for their intended purpose which is to help people stop smoking. Barbara was also the sponsor of The Teenage Driver Safety Act, which places reasonable restrictions on new teenage drivers. To strengthen Arizona's economy, Barbara has worked on policies to lower taxes, reduce red tape and encourage entrepreneurship, including her "angel investor" legislation to promote investing in small Arizona technology companies. In 2009, Barbara sponsored successful legislation (SB 1403) that will bring high paying jobs to Arizona by providing tax incentives for renewable energy manufacturing, research and development and headquarters facilities to locate in Arizona. Arizona should be the leader in the rapidly expanding solar industry and this law will give us the tools we need to accomplish this goal. For more information, see Barbara's Legislative Record. Barbara can be reached via email.